Garden Tower 2 Review – A Cool Compost Tower! Whether you love to garden or simply enjoy eating delicious, organic produce, having a system that allows you to easily do both would be worth its weight in gold, right? The Garden Tower 2 may be the system you need! What if you’re short on space? Perhaps getting down in the dirt is undesirable or difficult. This article is a Garden Tower 2 review, and gives you all the info you need to get started with this cool compost system! The Garden Tower 2 is a little powerhouse, boasting a 50-plant capacity in just four square feet of space! It’s a composter, it rotates a full 360° for easy access, and it is made of high-quality food-grade HDPE plastic. The Garden Tower 2 doesn’t fail to dazzle but don’t take our word for it—read on and decide for yourself! In this article, we’ll be looking at the various characteristics of the Garden Tower 2, from form and functionality to price and visual appeal, including how it compares to the competition. Recently named the “worlds most advanced container garden”, the Garden Tower 2 lives up to the billing with its unique design and quality construction. Attractive to look at, especially when full of thriving herbs, vegetables, or colorful flowers, this container garden will add beauty to any space. The GT2 holds more plants than any container garden on the market and is the only option with a self-contained composting tube. You simply load the tube with kitchen scraps, brown matter, and worms. No need for constant turning like a compost tumbler, or for adding water. It also has large openings for easy planting. The two-gallon capacity pull-out drawer at the bottom provides access to finished compost and compost tea: a nutrient-rich liquid you can reapply to your plants as organic fertilizer. It has a removable screen dividing the compost from the drawer. There’s no need for weeding, and the design saves time and water, retaining up to 14 gallons of water that’s distributed over six cubic feet of soil. You just water from your garden hose, pouring on the top, and the water filters down, reaching the plants all the way to the bottom. The rotating feature is a real bonus, allowing you to reach all your plants no matter how tight the space. It also allows even distribution of sunlight—simply turn it a couple times per week. A ball bearing track system makes rotating capability a breeze. This clever innovation has the ability to support over 1,000 pounds. The Garden Tower 2 stands 43” tall, 24.5” wide, and weighs 36 lbs. when empty (about 200 lbs. with wet soil) and contains a series of stackable planting rings that nest together. The center vermicomposting tube completes the picture. It has sturdy, evenly positioned legs that create a solid base in even the nastiest weather. This system earns top points for being environmentally conscious as well due to its durable food grade high-purity HDPE plastic construction. The UV-blocking non-toxic pigments serve to extend its life, providing up to 12 years of gardening enjoyment. The Garden Tower 2 assembly instructions are found on the company’s website along with demonstration videos. The company’s customer service department is also very responsive to any questions customers might have. The Garden Tower 2 won a 2014 IDA International Design Award and received the 2016 Green Thumb Award. It’s the only container garden to earn a Living Product Challenge Certification and is certified “Red List Free” meaning it contains no harmful chemicals that can leach into the water or soil. A few other container garden systems offer similar capabilities although none have the integrated composting feature or are made from food grade plastic. Mr. Stacky [Amazon Link] is made in the USA from BPA free plastic. 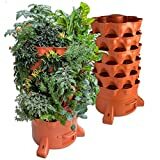 It has an attractive terracotta look similar to the Garden Tower 2 but only holds 20 plants. The main thing it has going for it is the attractive price, significantly less than the GT2. However, there’s no composting system, and it’s much simpler. The Greenstalk [Amazon Link] is a vertical gardening unit that boasts a patented internal watering system, is BPA-free, and is UV resistant. It’s also made in the USA and comes with a full five-year warranty. It has 30 planting pockets. This is the closest competition to the Garden Tower 2, though again it doesn’t have a composting feature. The main concern with this product is its high price tag. Also, you’re not able to grow large plants due to the confined space of the planting pockets. Of course, you need to work within the confines of the tower concept. Other issues have been with the vermicomposting tube and the screen that separates the compost from the pull-out drawer. Some buyers have experienced difficulty connecting the sections of the tube together during assembly. One customer said the tube fell to the bottom after six months of use, and a couple of people said the screen came apart after a few months. But these types of problems are few and far between, and the 5-year warranty should cover any issues that come up. The vast majority of customers have an extremely positive view of their GT2. The Garden Tower 2 is a choice you can feel good about. The company has taken great strides to create an environmentally friendly product with an innovative design. It’s truly an amazing all-in-one vertical garden for anyone with limited space or mobility issues! Its high-quality construction will give years of service and adds beauty to any space. With thousands of satisfied customers and a company that stands behind its product with a full five-year warranty, we feel the Garden Tower 2 is worth its weight in gold.